Fan Voltage Range 10V-14V with Cross-Regulation 25%/100% and 100%/25% load condition tests. Primary to Secondary Bridging Capacitance: Two IEC60384-14 certified Y1 type capacitors in series. Radiated RF Immunity EN61000-4-3, 10V/m 80-2700MHz, 80% 1KHz AM. Short term Output Surge Capability, to 275W. 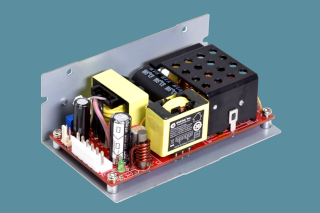 Up to 350W for reduced AC input voltage range. Fan output, replaced with Auxiliary output, selectable from 5V to 12V, option only for main output voltage 12V-24V. Fan should provide approximately 10CFM, in direction noted below, for full 225W output rating.